Do you want a better sound experience when you watch a movie at home, but don’t like to be bothered by the complicated installation of a surround sound system? Then you might want to consider getting yourself a soundbar. A soundbar is a great alternative to the large surround sound system because it allows you to have a better sound quality and at the same time it’s effortless to install. Just in case you do not know, a soundbar is a type of loudspeaker that is designed to help the sound of your television better. It is commonly connected through an optical, HDMI, a coaxial or RCA cable. Most soundbars only come with a subwoofer which makes them a 2.1 channel soundbar. Moreover, there are some that aside from a subwoofer, it also has two rear satellite speakers and that is what we call a 5.1 channel soundbar. This type can give that theater-like experience when watching, but remember that a soundbar is not a replacement for your surround sound system. If you are eyeing on a soundbar, there are a few things you need to consider. First, there are two types of soundbars called active and passive. Active soundbars is an all-in-one setup. Meaning the speakers and amplifiers are housed in one, long, plug-and-play bar. On the other hand, a passive soundbar is obviously the opposite. The amplifier will come separate, and there are some wires involved, therefore, it requires a bit of a setup. Second, look for a soundbar that has a Bluetooth capability. Although it might not be important to some, it is actually nice to be able to connect your phone to a soundbar wirelessly and play music. Lastly, if you want to get the full effect of the great musical scoring of the movie you are watching, it is important that you choose a soundbar that has a wireless subwoofer. Below we will be reviewing the VIZIO SB3851-C0 which might help you learn more about this particular sound equipment. It is a complete 5.1 channel, surround-sound home theater system. The whole system includes a wireless subwoofer, 38-inch soundbar and rear satellite speakers. It has a built-in Bluetooth technology for wireless audio streaming using mobile phones. Audio performance can reach up to 100 Db. It features DTS and Dolby audio technologies. It has two installation options: tabletop and wall mount. It comes with optical, coaxial and RCA cables. It produces an excellent sound quality. The speakers’ bass is awesome. The design of the sound system is attractive. It has a built-in Google Cast capability. The sound quality when playing music may not be as good as the audio when watching a movie or the television. The sound system has limited equalization setting. It is not capable of HDMI/ARC connection. There are times that the remote is not in sync with the soundbar’s settings. The satellite speakers are not wireless. The Vizio app does not work. In case you are not aware, Yamaha is not all about motorcycles; they also manufacture quality audio equipment. They actually have a whole line of soundbars in which the Yamaha YAS-207BL Sound Bar belongs. This soundbar has a number of similarities and differences with the VIZIO SB3851-C0 and those will be discussed below. Both of these soundbars are capable of wireless connection using their built-in Bluetooth technology which allows you to stream music from your mobile phone. Furthermore, both have the DTS audio technology for a great sound experience. Each of these soundbars comes with a dedicated remote control and an application that you can install on your mobile phone. Lastly, both come with powerful, wireless subwoofers. Although these soundbars can similarly make your viewing experience awesome, they do have a lot of differences, starting with their connection options. 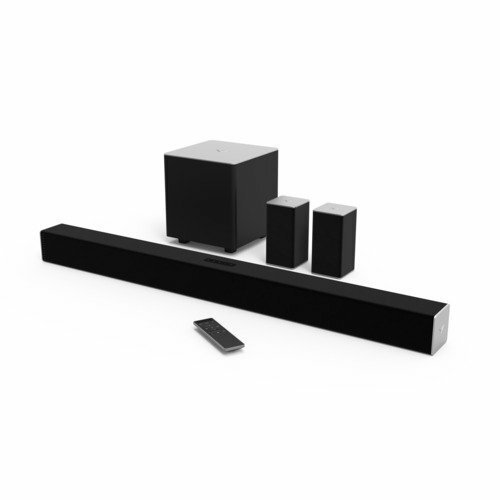 The Yamaha YAS-207BL Sound Bar is not only capable of optical connections, it is also capable of HDMI connectivity, while the VIZIO SB3851-C0 can only be connected through optical, coaxial and RCA cables. Moreover, the Yamaha YAS-207BL Sound Bar comes only with a wireless subwoofer, whereas, the VIZIO SB3851 does not only have a wireless subwoofer, it also has rear satellite speakers. Unlike the VIZIO SB3851 that has both the Dolby and DTS audio technology, the Yamaha YAS-207BL Sound Bar only has the DTS audio. Now that we have mentioned their similarities and differences, we can say that the VIZIO SB3851-C0 is a better option because it has both the Dolby and DTS audio technologies, which will give you a better sound experience. However, if you need a soundbar that will allow you to connect through HDMI, then the Yamaha soundbar is your choice. The VIZIO SB3851-C0 is a great entry-level sound system for your home because it is equipped with the DTS and Dolby audio technology. Moreover, its Bluetooth connectivity is a great feature especially if you love to listen to music through your phone but don’t want the hassle of cables. It’s sleek and durable design is a great addition to your TV room. On the downside, this soundbar may only be suitable for small rooms, even though it’s a 5.1 channel-soundbar. The additional rear speakers did not help improve the sound quality because when it was used in a larger space, the audio quality seemed different. Therefore, we recommend the VIZIO SB3851-C0 if you are living in an apartment or condo or if your TV room is not that huge. But if you are living in much larger space, it would be better to look for a soundbar suitable for larger areas or install a traditional surround sound system instead.